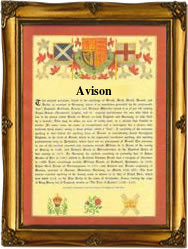 This interesting surname in the spelling of Aves, Avis, Aviss, Aveson and Avison, derives from the personal name "Avis", originally an exceedingly old Germanic name, introduced into England after the Norman Conquest of 1066. The first known form of the name was "Haduwig" (whence modern German "Hedwig"), meaning "refuge in war"; the French form was softened to "Edwige", and in the Norman dialect it became "Havoise". By degrees this was shortened to "Havoisia", "Avicia", "Avice", and finally "Avis". In its variant forms it is frequently found in medieval records, but nowadays only the forms "Avis" and, less commonly "Avice" are found. "Auicia" (without surname) is noted in the Register of St. Benet of Holme, Norfolk (1175), and Ricardus filius (son of) Avice is listed in the Subsidy Rolls of Staffordshire (1332). The surname is first recorded in the latter half of the 12th Century (see below). Thomas Avyce was listed in the Book of Fees of Berkshire (1220), and Thomas Avis was noted in the Subsidy Rolls of Suffolk (1524). Recordings of the surname from London Church Registers include: the christening of Richard, son of Roger and Sarah Aves, on October 12th 1655 at Allhallows the Less, and the marriage of Edmund Aves and Sarah Morgane on January 5th 1692 at St. James', Duke's Place. The Coat of Arms most associated with the family is a blue shield with three gold wheat sheaves, the Crest being a dexter hand vested, cuffed, holding an anchor. The first recorded spelling of the family name is shown to be that of Walter Auices, which was dated 1186, in the "Register of St. Benet of Holme, Norfolk", during the reign of King Henry 11, known as "The Builder of Churches", 1154 - 1189. Surnames became necessary when governments introduced personal taxation. In England this was known as Poll Tax. Throughout the centuries, surnames in every country have continued to "develop" often leading to astonishing variants of the original spelling.